So far we have seen how supply and demand together determine a market's equilibrium, which in turn determines the price of the good and the amount of the good that buyers purchase and sellers produce. 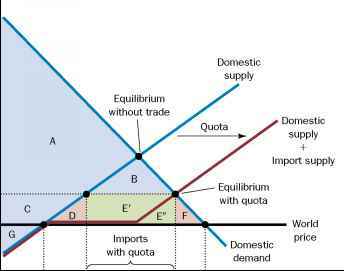 Of course, the equilibrium price and quantity depend on the position of the supply and demand curves. When some event shifts one of these curves, the equilibrium in the market changes. The analysis of such a change is called comparative statics because it involves comparing two static situations—an old and a new equilibrium. Markets Not in Equilibrium. In panel (a), there is a surplus. Because the market price of $2.50 is above the equilibrium price, the quantity supplied (10 cones) exceeds the quantity demanded (4 cones). Suppliers try to increase sales by cutting the price of a cone, and this moves the price toward its equilibrium level. In panel (b), there is a shortage. Because the market price of $1.50 is below the equilibrium price, the quantity demanded (10 cones) exceeds the quantity supplied (4 cones). With too many buyers chasing too few goods, suppliers can take advantage of the shortage by raising the price. 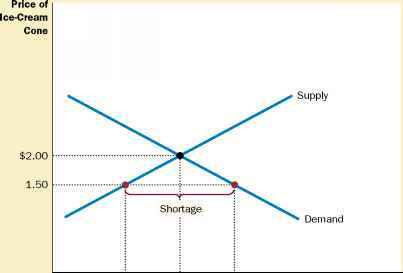 Hence, in both cases, the price adjustment moves the market toward the equilibrium of supply and demand. r shift affects the equilibrium price and quantity. Table 4-7 summarizes these three steps. To see how this recipe is used, let's consider various events that might affect the market for ice cream. Example: A Change i n Demand Suppose that one summer the weather is very hot. How does this event affect the market for ice cream? To answer this question, let's follow our three steps. 1. The hot weather affects the demand curve by changing people's taste for ice cream. That is, the weather changes the amount of ice cream that people want to buy at any given price. The supply curve is unchanged because the weather does not directly affect the firms that sell ice cream. 2. Because hot weather makes people want to eat more ice cream, the demand curve shifts to the right. 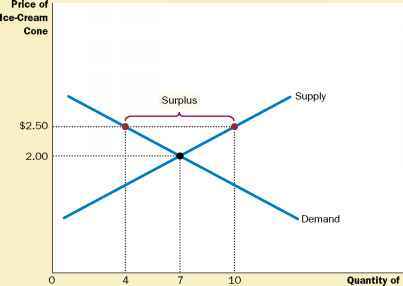 Figure 4-10 shows this increase in demand as the shift in the demand curve from D1 to D2. This shift indicates that the quantity of ice cream demanded is higher at every price. 3. As Figure 4-10 shows, the increase in demand raises the equilibrium price from $2.00 to $2.50 and the equilibrium quantity from 7 to 10 cones. In other words, the hot weather increases the price of ice cream and the quantity of ice cream sold. Shifts in Curves versus Movements along Curves Notice that when hot weather drives up the price of ice cream, the quantity of ice cream that firms supply rises, even though the supply curve remains the same. In this case, economists say there has been an increase in "quantity supplied" but no change in "supply." How weather affects the price and quantity of ice cream cone? What are three steps to analyzing changes in equilibrium?